People jumped at the chance to give the Santa Barbara City Council direct feedback on the issue of revitalizing the downtown core, and in addition to dozens of them speaking during Tuesday’s meeting, a large group of stakeholders submitted a list of recommended actions to the city. With scores of suggestions, the City Council ultimately decided to hire a consultant to sort through them and form a subcommittee to oversee that. The consultant will work on a strategic plan with a short-term focus, and prioritize the items recommended Tuesday as well as from input over the last 18 months, City Administrator Paul Casey said. The economic vitality of State Street has been a topic of conversation for years, and it drove a standing-room-only crowd to City Hall Tuesday after Mayor Cathy Murillo and Councilman Randy Rowse put the city’s revitalization efforts on the agenda. Nina Johnson, senior assistant to Casey, started off the meeting by presenting a list of all the active projects by the city and other organizations that focus on downtown, especially State Street. Members of the City Council and the public voiced support for many of the items on the list – such as helping property owners and businesses hook up to create temporary pop-up stores in vacant spots – which are mostly already underway or in planning. Johnson also noted the city is working with Downtown Santa Barbara to reboot First Thursday events, and bring “fresh life into what we’ve been doing for so many years.” And the city is considering some test weekends to try out new ideas, such as street closures for events. Dave Lombardi, the acting head of Downtown Santa Barbara, said the city is going through a renaissance, and a public-private partnership between the city and business organizations is the way to move forward. Council members said they want to get momentum on some fixes, and some voiced support for issues suggested by the public, including more downtown events, more housing downtown, closing down blocks of State Street temporarily or permanently to create a pedestrian mall, hiring an economic development director, and reviewing its own planning and permitting process. Related to that, Community Development Department Director George Buell said staff can look at the recommendations to expedite permitting, and report to the new subcommittee, which includes Murillo, Rowse and Councilman Eric Friedman. A majority of the speakers at Tuesday’s meeting complained about the arduous process to open a business, make tenant improvements, or otherwise go through the city permitting process. “It’s a horrible process,” said Bob Stout, who owns the Wildcat Lounge and Little Kitchen. He suggested that the city add the 10 recommendations from the task force list to the efforts on its list of revitalization efforts. “I don’t think State Street is broken but I think it’s damaged,” he said. Former mayor and councilman Hal Conklin said “downtown was pronounced dead” multiple times in the past, but it’s on the right path now – it just needs a comprehensive plan. The difference between Hearst Castle and the Winchester Mystery House, he posited, is a building designed by a world-class architect (Julia Morgan) versus one built willy-nilly. As to the delays for permitting, Conklin suggested the city hire an ombudsman to help people through the review process. The city can have high standards and efficiency, he said. 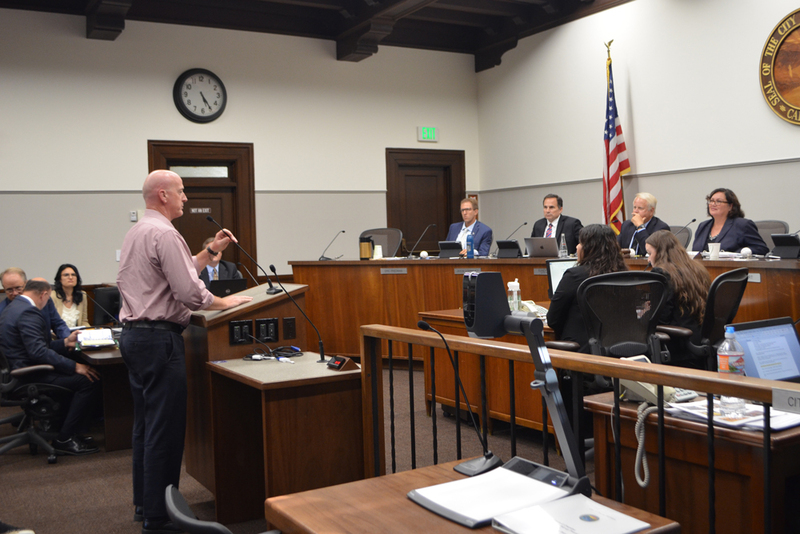 The so-called State Street Task Force formed recently by the World Business Academy submitted a list of 10 recommendations to the City Council Tuesday, and the letter was signed by more than 100 business owners, property owners, and other stakeholders. “After learning that Downtown Economic Vitality was going to be on your agenda, a large group of community members came together to develop a proposed list of strategies and solutions for your consideration. While this falls far short of a comprehensive strategic plan, we are hopeful our input can be of service in your efforts to revitalize downtown,” the letter says. There are “so many people who care, as we see today, we just all need to get on the same page,” said Amy Cooper, the owner of Plum Goods and chair of the task force. The recommendations focus on the city revamping its planning and permitting process for businesses, and bringing more people downtown with events. » The city developing a guide to the permitting and planning process, including timelines. “The current length of time it takes to get projects permitted and businesses open deters desirable operators from choosing to lease in Santa Barbara, and this has a direct impact on vacancy rates and downtown vibrancy,” the group wrote in the letter to the City Council. » Create consistent oversight for the planning and permitting process, including monthly updates to the City Council. “This will ensure that projects are handled in a timely manner and are not rejected or arbitrarily delayed based on the changing opinions of decision makers rather than agreed upon guidelines,” the letter says. Downtown Santa Barbara is already taking the lead on conducting outreach to property owners, which was one of the recommendations, marketing and communications director Kate Schwab noted. Click below to read a complete list of the recommendations, and the task force’s letter to the City Council. — Noozhawk managing editor Giana Magnoli can be reached at gmagnoli@noozhawk.com.